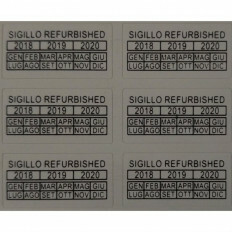 Anti-tampering labels with warranty seal.42 pieces pack, 1 cm x 2.5 cm each one.Discounted price for multiple pieces.Ideal for protecting parts of pc, notebooks, tablets, mobile phones; water resistant.Measurements and quantities with personalized writings over 1000 pieces. 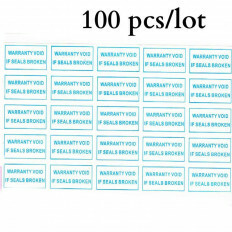 Anti-tampering labels with warranty seal.42 pieces pack, 1 cm x 3.3 cm each one.Discounted price for multiple pieces.Ideal for protecting parts of pc, notebooks, tablets, mobile phones; water resistant.Measurements and quantities with personalized writings over 1000 pieces. 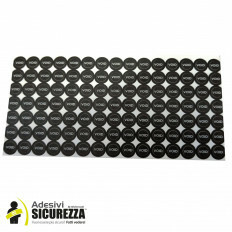 Anti-tampering labels with warranty seal.100 pieces pack, 15mm diametre each one.Discounted price for multiple pieces.Ideal for protecting parts of pc, notebooks, tablets, mobile phones; water resistant.Measurements and quantities with personalized writings over 10000 pieces. 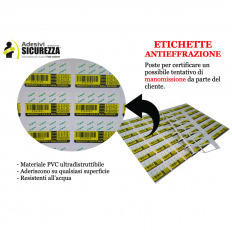 Anti-tampering labels with warranty seal.108 pieces pack, 1,5 cm diametre each one.Discounted price for multiple pieces.Ideal for protecting parts of pc, notebooks, tablets, mobile phones; water resistant.Measurements and quantities with personalized writings over 1000 pieces. 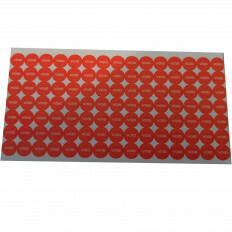 Anti-tampering labels with warranty seal.100 pieces pack, 10x 20mm each one.Discounted price for multiple pieces.Ideal for protecting parts of pc, notebooks, tablets, mobile phones; water resistant.Measurements and quantities with personalized writings over 1000 pieces. 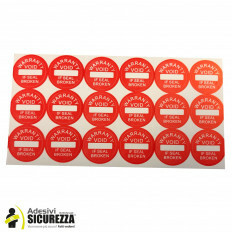 Anti-tampering labels with warranty seal and inscriptions "Warranty void" and "If seals broken".100 pieces pack, 10x 20mm each one.Discounted price for multiple pieces.Ideal for protecting parts of pc, notebooks, tablets, mobile phones; water resistant.Measurements and quantities with personalized writings over 1000 pieces. 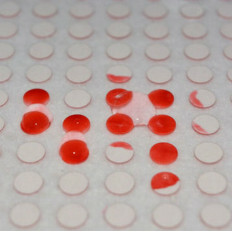 Anti-tampering labels with warranty seal and inscription "Warranty void if seal broken or removed".100 pieces pack, 15x5mm each one.Discounted price for multiple pieces.Ideal for protecting parts of pc, notebooks, tablets, mobile phones; water resistant.Measurements and quantities with personalized writings over 1000 pieces. 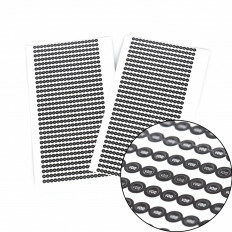 Anti-tampering labels with warranty seal and "VOID" inscription.105 pieces pack, 5mm diametre each one.Discounted price for multiple pieces.Ideal for protecting parts of pc, notebooks, tablets, mobile phones; water resistant.Measurements and quantities with personalized writings over 10000 pieces. 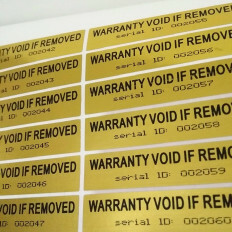 Anti-tampering labels with warranty seal and inscription "Warranty void if removed".100 pieces pack, 10x30mm each one.Discounted price for multiple pieces.Ideal for protecting parts of pc, notebooks, tablets, mobile phones; water resistant.Measurements and quantities with personalized writings over 1000 pieces. 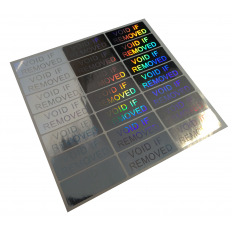 70 adhesive labels 1x3 cm with holograms.Printed with mirror effect with the writing "WARRANTY VOID IF REMOVED".Holographic material ; it leaves a mark if removed.Ideal for protecting components from tampering, your correspondence and beyond! 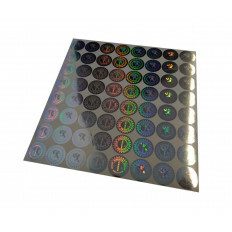 100 security hologram stickers measuring 2x5 cm (extra large size for packages)Printed mirror effect with the inscription"VOID IF REMOVED". 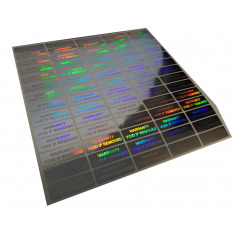 (holographic material, moving the label changes the color)Holographic material,leave a mark once removed.Ideal to protect components from tampering, your correspondence and more! 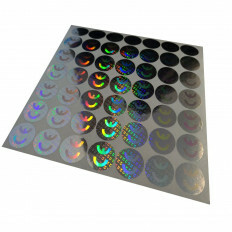 100 adhesive circular labels with holograms; 20mm diametre each one.Holographic material ; it leaves a mark if removed.Ideal for protecting components from tampering, your correspondence and beyond!They are the most reliable security solution to protect against counterfeit goods.High quality product guaranteed by the manufacturer. 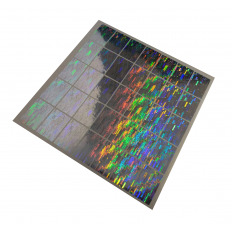 100 adhesive labels in size of 15x15mm each piece with holograms.Printed with mirror effect with the writing "2018".Holographic material ; it leaves a mark if removed.Ideal for protecting components from tampering, your correspondence and beyond! 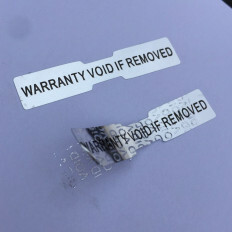 84 security holographic adhesive labels measuring 1x5 cm, silver color/ P>Printed mirror effect with the inscription"WARRANTY VOID IF REMOVED".Holographic material,leave a mark once removed as shown in the photo.Ideal to protect components from tampering, your correspondence and more! 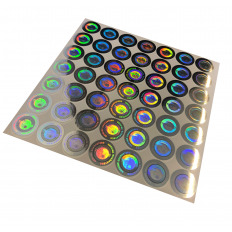 70 security hologram stickers measuring 3x3 cm, silver color with orographic refraction/ P>Mirror-effect print with letteringHolographic material,leave a mark once removed as shown in the photo.Ideal to protect components from tampering, your correspondence and more!